In 2017, media highlights of hospital closures, mergers and financial troubles were common. For health care providers and insurers, 2018 is marked by considerable challenges, risks and uncertainties. As in 2017, there were heated debates between legislators and health care advocates over tax reforms and service outcomes. This year also marks a continuance of the shift in thought from service volume to community health outcomes. Now, health care leaders are working to create value, manage organizational finance strategically and improve community health outcomes. Furthermore, more than 30 states are considering legislation to regulate drug cost transparency and prices. Across the nation, the opioid epidemic is a growing national concern. Resolving this blight will require collaboration between health care leaders, physicians and drug manufacturers. In the meantime, the United States is spending more to cover medical expenses compared to all other nations but trailing in positive health outcomes. With little progress emerging on the federal legislative front, state officials are developing their own reforms, and third-party health care vendors are subject to increased scrutiny. Additionally, consumers are taking more responsibility for their own health. As the Internet of Things (IoT) expands, the government reports a more than 500-percent increase in medical device security vulnerabilities, and there've been several major health care cybersecurity breaches. Despite this, early adopters are using artificial intelligence to bring back the human touch in caregiving, streamline administrative work and improve operations. Analysts forecast that Medicare will cover nearly 21 million people - a 5-percent increase compared to 2017. Health care analysts expect a steady increase in the number of insured Americans. As the year continues, the government will continue efforts to streamline health care spending, increase access to affordable health insurance and revise the Affordable Care Act. As this occurs, the demand for skilled medical professionals will rise. The FDA is prompting drug manufacturers and health care enterprises to make meaningful use of patient information. There's a growing focus on multidisciplinary collaboration to meet the demands of the population’s health needs. This year, health care leaders are working diligently toward improving operational efficiency and organizational performance as well as liability and risks. To keep pace with this whirlwind of changes, health care organizations must now make innovative choices. Care providers must adapt to a new age in medicine where patient satisfaction is a top priority. Health care providers now face the reality that consumers have options. This is increasingly important as more patients realize that they have voices and access to health care. There’s competition brewing on the digital front as more care provider organizations engage potential patients online, and the stigma surrounding mental health is slowly fading away, as integrated care models emerge to heal the body and mind together. 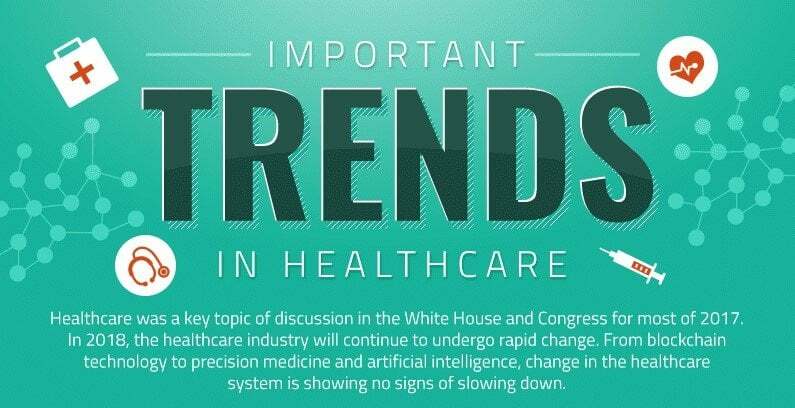 Despite what looms ahead, health care leaders will need to embrace change in order to survive. Those who do not will lose the trust of patients and face severe financial setbacks. To find out more about the latest trends in health care, click here to view an enlightening infographic created by Duquesne University’s Online School of Nursing.